According to forecast made by the Euromonitor, China will exceed the United States and become the world’s largest apparel market by 2019. Specifically, annual apparel sales in China will reach $333,312 million in 2019, an increase of 25% from $267,246 million in 2014. In comparison, apparel sales in the United States is estimated to reach $267,360 million in 2019, which is only 3% higher than $260,050 million in 2014. However, it shall be noted that China seems to be an even more competitive apparel market than the United States. For example, no apparel brand was able to achieve a market share more than 1% in 2014 in China, whereas in the United States, market shares of several leading apparel brands exceeded 2%. 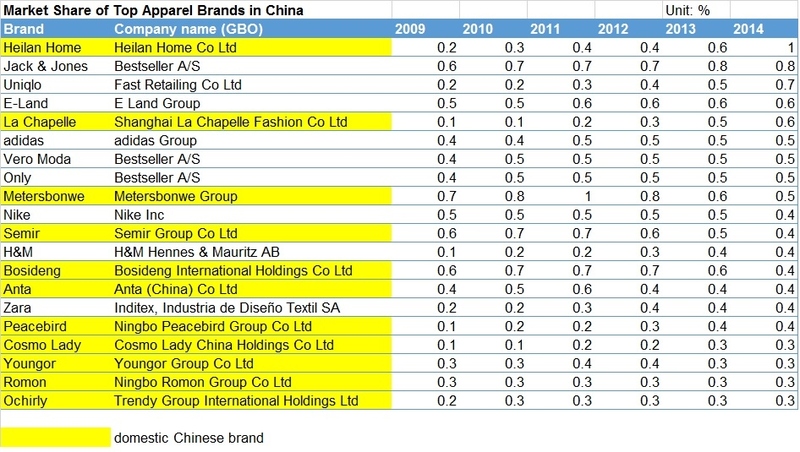 Moreover, domestic brands overall outperform international brands in the Chinese apparel market. On the other hand, despite its overall market size, as a developing country, dollar spending on apparel per capita will remain much lower in China than many developed economies around the world. In 2014, each Chinese consumer on average spent $240 on apparel versus $815 in the United States, even though apparel spending accounted for a larger share in household income in China (around 10%) compared with the United States (less than 3%). First, it is the time that U.S. apparel companies/fashion brands should start to seriously think about their sourcing strategy specifically for the Chinese market. Second, for many Chinese apparel companies, serving the domestic market will help them more effectively achieve functional upgrading (i.e. shifting from low-value added manufacturing to higher-value added functions such as design, branding and distribution) than through exporting. Third, controlling sourcing cost will be as important in China as in the United States. When China’s applied tariff rate is still as high as 9.63% for textiles and 16.05% for apparel (WTO, 2015), U.S. fashion companies/fashion brands may not have many options but to use “Made in China” to serve the Chinese consumers. In the long run, however, “Made in China” shall be gradually replaced by “Made in Asia”, especially when several free trade agreements (FTAs) involving China eventually take into effect (such as CEPA). However, China may strategically use rules of origin in these FTAs and encourage apparel manufacturers in the region to use Chinese made textile inputs (just like what U.S. did in NAFTA and CAFTA). Nevertheless, either for managing the apparel supply chain based on “Made in China” or “Made in Asia”, it doesn’t seem U.S. apparel companies/fashion brands will easily enjoy competitiveness over their Chinese competitors. This blog has definitely got me thinking about the future of our apparel and textile industry, especially if we as designers want to be able to compete in the Asia sector for apparel. Above in the text it says that 25% of sales will be increased from 2014 to 2019, meaning that China will surpass America and become the world’s largest apparel sector in the world. It also says that despite China being a developing country, every dollar spent on apparel per capita will still consistently remain much lower in China than many other developed economies. With these facts and others, it makes me wonder what China has done to become a country who can have a low capita on apparel and we still are spending hundred per person a year. If we want to stand a chance in the future exporting to China, we needed to find a lower our costs on production while still trying to remain conscious of ethical labor production. It also says that much of China’s population is focused on buying products that say “made in China” rather than any other countries, showing they are very dedicated to the country they live in raising the question can we even compete? In the future, I believe not only will we have to come up with a way to keep our comparative advantage when it comes to apparel brand marker shares, but also how we will use the country loyalty in Asia to our advantage when selling to China. One idea could be bringing on of our American countries into China and specifically having that company sell to the Asian market there but still maintaining the US identity. This idea will need years to develop and in the meantime, anything could change that cannot be predicted that might wipe us out in apparel for good. good thinking! Two follow up comments: 1) Chinese consumers on average will spend less on purchasing clothing because their income level is also lower. 2) It is a great question that to which extent U.S. based apparel designers can help design clothing “made for China”. There is growing tendency (as I observe) that Chinese apparel companies want to have more control of their own supply chain… I agree that many things will gradually evolve in the years ahead. this is why T&A is such a dynamic sector. 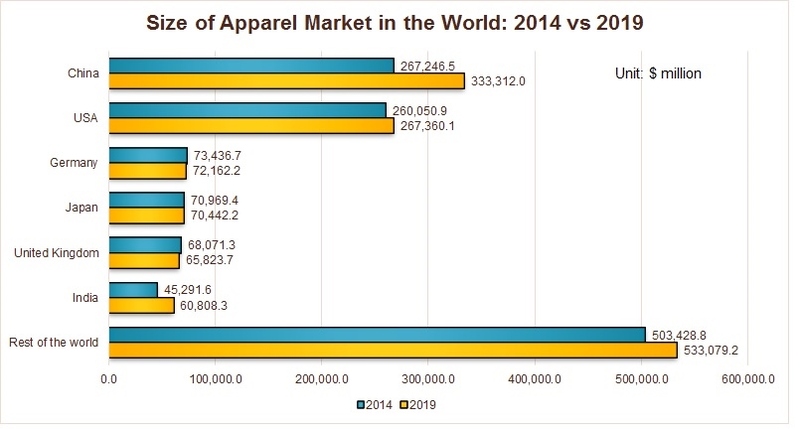 In 2014, China and the United States were almost equal in relation to the sizes of their apparel markets. China consumed 21% of the world’s total apparel market whereas U.S. consumed 20%. By 2019—in just three more years—China will become the world’s largest apparel market, specifically expected to become 24% of the total apparel market in the world, and the U.S. is expected to fall to 19% of the total apparel market. In my opinion, that itself is very interesting and goes to show how quickly China grows as a nation. Furthermore, the blog post provides statistics on just how fast the China apparel market is growing. From 2014 to 2019, China’s annual apparel sales are expected to increase by 25% whereas the United State’s annual apparel sales are expected to increase by only 3%. 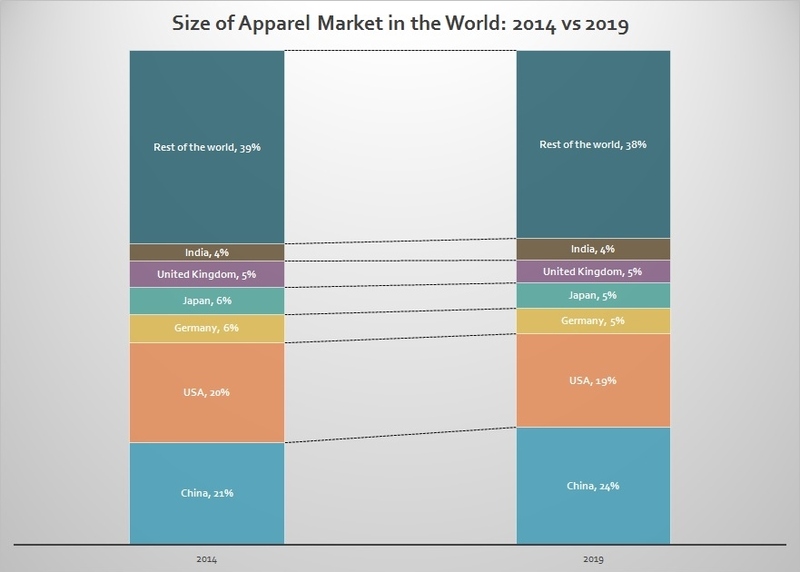 In addition, China is a more competitive apparel market than the U.S., with “no apparel brand being able to achieve a market share of more than 1% in 2014”. However, China’s dollar spending on apparel per capita was much lower than the U.S.’s in 2014—$240 per Chinese consumer and $815 per U.S. consumer. 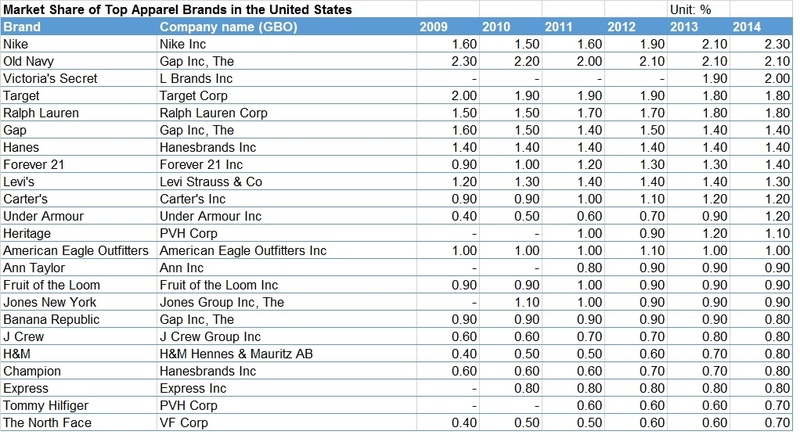 How is it that their annual apparel sales are expected to then increase 22% more than the U.S.’s annual apparel sales over a five-year period? What other factors contribute to this large increase in apparel sales besides the fact that their apparel market is also growing? As we learned in class, resources are scarce and China is a “winner” in the clothing industry, as it is an export-oriented industry. U.S. will need to keep up their comparative advantage in their specific export-oriented sectors, as their clothing industry is an import-competing industry. It does not surprise me at all that China has the potential to become the world’s largest apparel sector. What surprises me is how the U.S. has not caught on to certain production tactics that are used in China in order to implement this statistic. 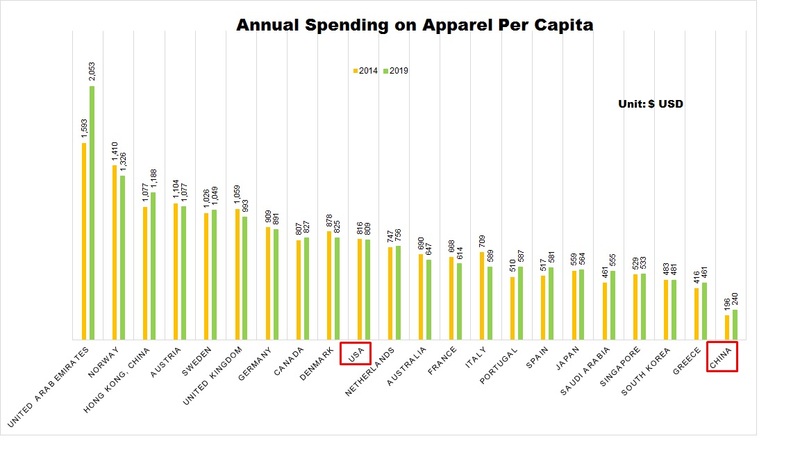 It is crazy to me that China is able to keep dollar spending on apparel per capita so low while still increasing spending. How has the U.S not figured out a way to compete with the statistics of China? Would it be more beneficial to partner with China rather than compete? The article also says Chinese consumers are more concerned with only buying products that are “made in China”. The US needs to figure out a way to ethically lower production costs so that we can bring down prices and increases sales in order to compete with China. If the US economy remains how it is, and also if problems with raising the minimum wage occurs, will the future of American apparel industry have to rely on the Chinese market? It is important to learn what works for the Chinese market and figure out how to better improve US sourcing strategy. It is no doubt that China still has many rooms to develop T&A industry as they just to develop their facilities in different areas. Compare to U.S., it has already achieved the golden age and start to decline in the apparel industry. Therefore, the forecasted market size of U.S. will have 1 % shrinkage while China will exceed 24%. For China, it is still at the early stage of their development. With their education, financial and political development, they could provide a more sophisticated to global investment. Also, the population of China is one of the keys to the growing apparel market regarding the workforce or consumer base. However, the gap between the rich and the poor are significant in China. We can see a lot of rich people living in cities like Shanghai, Bejing or Shenzhen while some of the farmers still trying to make a living by growing plants or even picking garbage. Even though China has a large population but it does not equal to large consumer base especially for affording international brand’s goods. In contrast, many households in U.S. are the middle class which has bigger consuming power. Therefore, the average consumption expense in U.S. will still maintain higher than China. I think it still has to wait a long while for China to catch the same consumption of U.S. as they have to balance the income of such a large population. It’s not at all shocking that China could potentially soon pass the U.S. in becoming the world’s largest apparel market, as us FASH students constantly hear about how China is advancing in the industry. I did find the spending difference between the American and Chinese market to be very interesting. Perhaps it’s because products in China are cheaper as they are produced domestically and don’t need to take import taxes into account? Or possibly Chinese consumers are more price sensitive? Either way, China’s technological innovation and huge export market will continue to put them ahead as the apparel and textile industry continues to grow in the upcoming years. I also wonder if the U.S. industry thinks of this as a potential threat, or if they continue to feel secure in our own domestic market as we are obviously extremely successful as of right now. It makes sense for China to become one of largest clothing market during the whole world in 2019. China’s 1.3 billion people make up a huge consumer market for apparel, and the market is gradually expanding. Judging from the whole industry, China’s clothing brands have formed a new two different camps because of the changes in the market consumption structure. The first is the high-end clothing line. This segment of consumers is a high－income group, and their spending power on luxury goods and high-end brands is growing, and customers also more care about the quality of clothing and services. The second is the popular line of clothing sales, such as Uniqlo, Zara, H&M, affordable, fashion design, especially for young consumers. However, at present, China’s high-end clothing market is almost occupied by clothing brands from France, Germany, Italy, Japan, the United States, Britain and South Korea. Hong Kong and Taiwanese brands are mainly concentrated in the mid-market, while domestic brands are mainly concentrated in the middle and low-end markets. Therefore, in my opinion, China needs design, manufacture and develop more of their own high-end brands to ensure better and better. Previous Previous post: Does AGOA’s “third country fabric” provision discourage the development of Africa’s local textile industry?